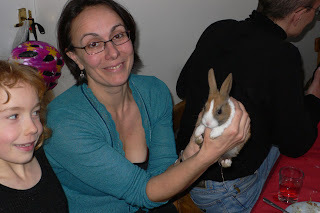 A few years ago, my sister Poppy (pictured above with daughter Ruby) won £3,000 after selecting five out of the six winning numbers in the National Lottery draw. She described herself as being torn between delight at receiving a £3,000 windfall and bitter disappointment at failing to choose the one extra number that would have made her an overnight millionairess. At least she got a consolation rabbit. So had the book been judged on content alone, there is a distinct possibility that it would have been awarded one of the prizes. So near, yet so far. At least this counts as more evidence (in addition to the positive reviews on Amazon and the ever-growing collection of delightful emails I receive from readers) that agents and mainstream publishers who rejected the manuscript might just have slipped up. 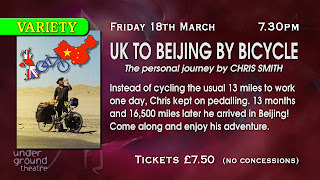 I've been doing talks and slideshows about the Great Bicycle Ride to clubs and societies for around four years now. At the end of last year we decided to approach libraries, museums, village and town halls and small theatres in an effort to take the presentations out to the general public. 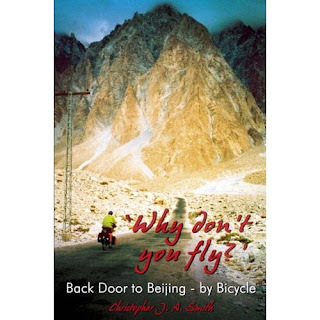 So far we are averaging audiences of around 50 people and we usually sell about 15 copies of 'Why Don't You Fly?' each time. I don't think public speaking will ever exactly be 'comfort zone' but my horror of it has diminished considerably. The best thing about giving presentations, both to clubs and societies, and to the general public at theatres and town halls, is that during the interval and afterwards, I meet some truly delightful people who all want to shake my hand, congratulate me, ask questions about the journey and get their copy of 'Why Don't You Fly?' signed. Naturally we'd like to reach bigger audiences, but we have been left in no doubt that those who do come out for the evening return home satisfied with their evening's entertainment, and sometimes inspired by it. Last month we went to Malvern Theatres to listen to Ed Stafford talk about his two-and-a-half-year trek from the source of the Amazon to the sea. During the interval a heard someone in the row behind say, 'Excuse me, but are you Chris?' Directly behind us was a young couple who'd come to see me speak in April at Malvern's much smaller Coach House Theatre. They informed me that not only had the presentation been 'fantastic' but that it had inspired them to plan a bike-ride to Istanbul. I left the theatre having thoroughly enjoyed Ed Stafford's account of his remarkable adventure, but without any sense that my own presentation was inferior and wishing that I too had the opportunity to inspire audiences of 600 instead of 60.